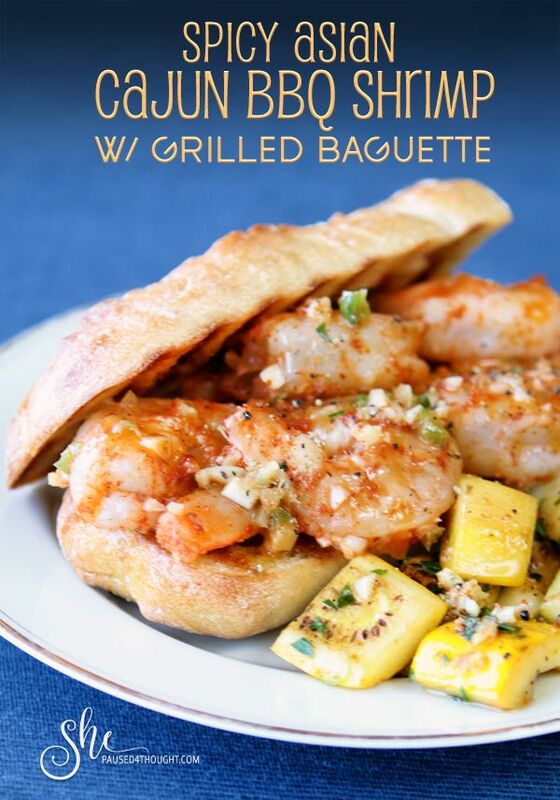 This recipe for Spicy Asian Cajun BBQ Shrimp with Grilled Baguette is uniquely spiced for a sandwich full of flavor. 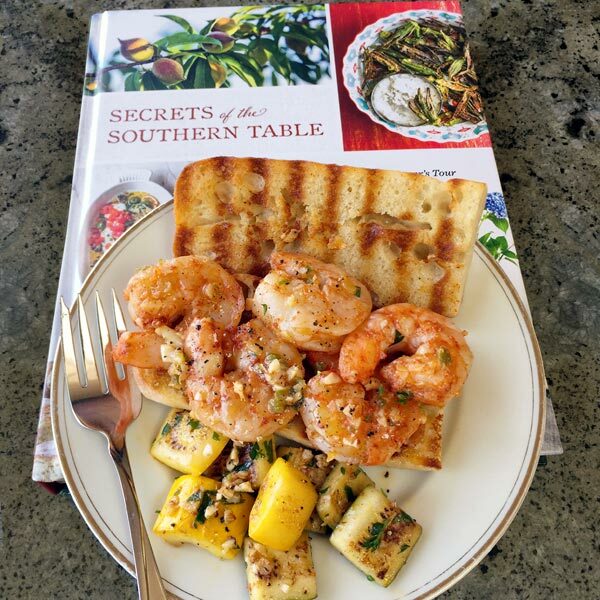 Spicy Asian Cajun BBQ Shrimp with Grilled Baguette is truly representative of the new global southern kitchen as told about in Secrets of the Southern Table by award-winning chef and cookbook author Virginia Willis. Virginia traveled to 11 southern states to tell the stories of local farmers, catchers, harvesters, and artisans who enrich the current Southern food scene. The 80 recipes in Secrets of the Southern Table reflect Virginia’s passion for discovering and presenting the unexpected in southern cuisine. 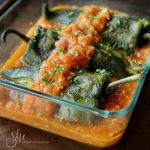 What’s more, each recipe is geared for the home cook, so anyone can make any one of them easily, at home. 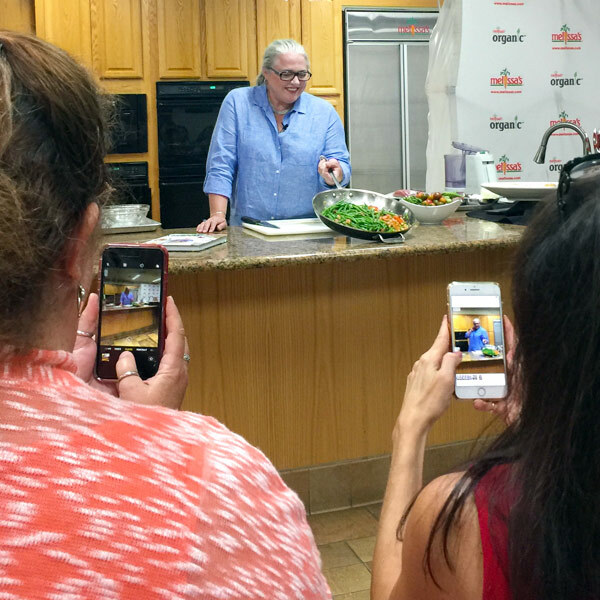 I recently met Virginia Willis, who is French-trained and born and raised in Georgia, at a Melissa’s Produce luncheon and demo. Virginia is the epitome of Southern grace and charm. She demonstrated how simple it is to make her Southeast Asian-inspired Tomato-Ginger Green Beans recipe on page 36. Fellow bloggers Sarah from My Imperfect Kitchen & Sue from It’s Ok to Eat the Cupcake taking in Virginia’s southern charm and simple techniques. I have made this recipe several times at home and now I can’t imagine cooking green beans without the added ginger. 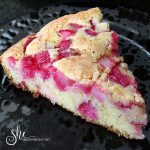 Here are a few of the other recipes we tasted. 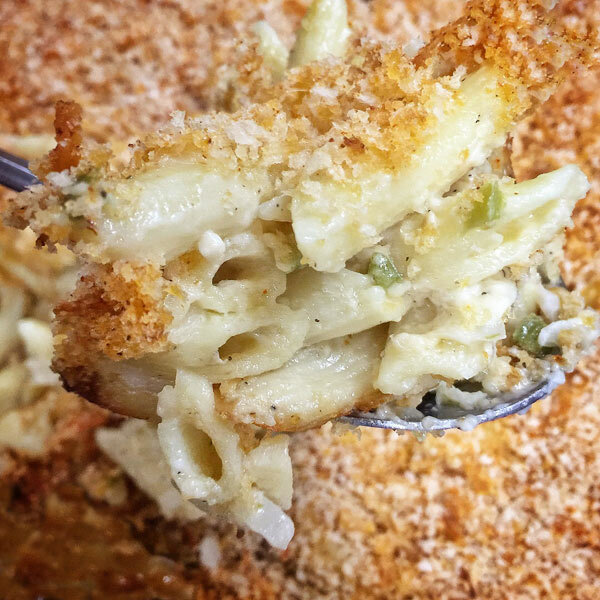 With the addition of jalapeno and hot sauce, this perfectly spiced mac and cheese is a new favorite for me. 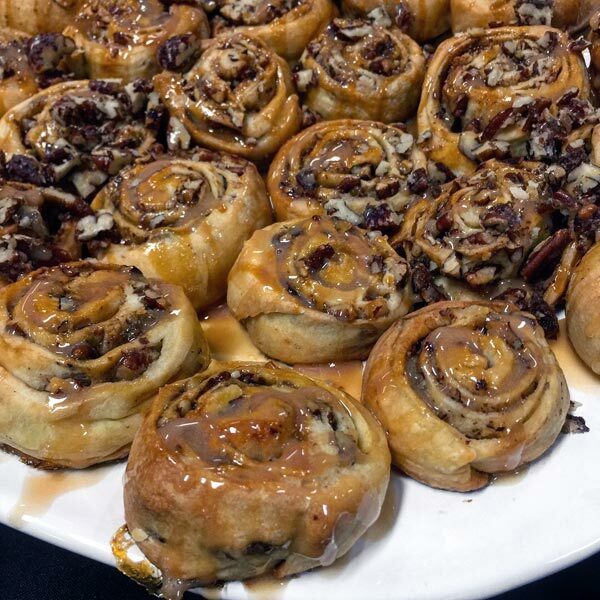 Dulce de Leche loosely translates to “sweet jam of milk” and seriously now, this element elevates cinnamon rolls to another level of sugary gooey heaven. 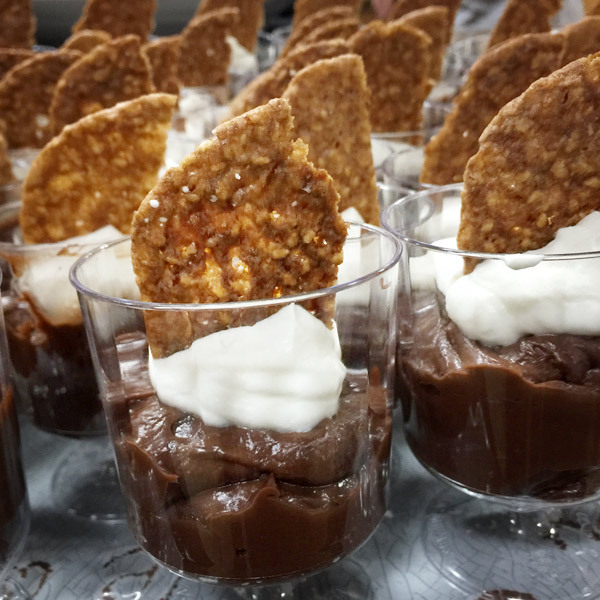 The twist in this Chocolate pudding is the cinnamon and cayenne pepper that gives its creamy goodness a touch of heat that complements the sweetness. 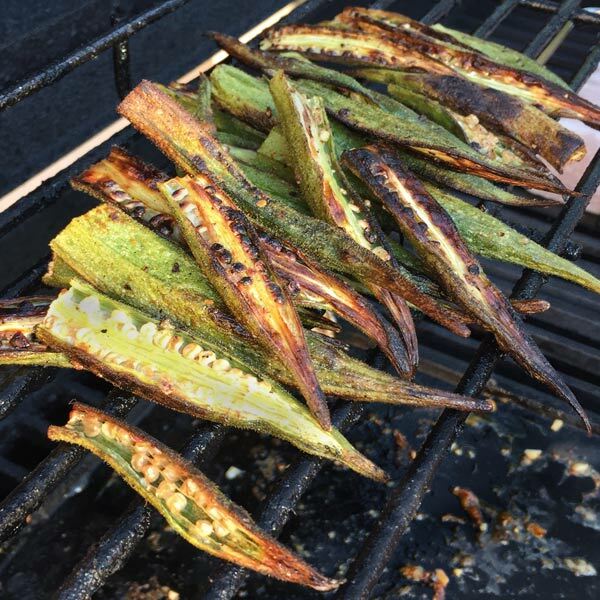 If you haven’t tried grilling okra, it is super easy and tasty when paired with Virginia’s Spicy Yogurt Dipping Sauce on page 28. 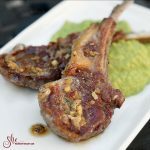 It’s earthy and undeniably green flavor caramelizes on the grill, and when I made it at home, it was met with rave reviews from our guests couldn’t believe it was okra. As if all of these recipes weren’t good enough, well, there is the amazing sandwich below. It combines so many delicious flavors and textures that you might want to eat the shrimp right out of the pan. I could see this shrimp also served in a lettuce cup for a lighter lunch. BBQ shrimp in New Orleans has nothing to do with the grill or BBQ sauce. It is a dish of butter-poached shrimp flavored with spices and herbs. In the nineteenth century, trade routes opened between Sicily and New Orleans and thousands of Italians migrated to the U.S. By 1870, New Orleans claimed the largest Italian born population in the US. A more recent immigration of Vietnamese people explains the new flavors in this very Southern dish. 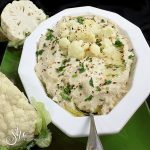 This dish comes together quickly as you only cook it for a few minutes in a pan, grill your bread and serve. 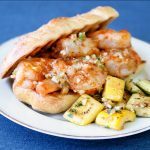 I served this Spicy Asian Cajun BBQ Shrimp with Grilled Baguette alongside Seared Summer Squash with Spiced Lemon Vinaigrette. 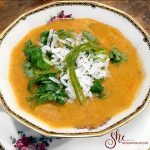 This perfectly spiced dish was inspired by chef-owner Rafih Benjelloun of Imperial Fez, a beloved Moroccan restaurant in Atlanta. 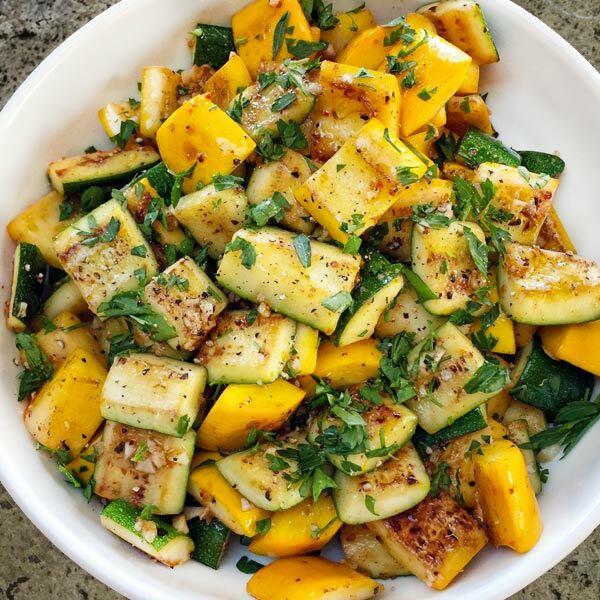 Virginia explains in her book the importance of cutting the seeds off the squash to prevent the dish from being too watery, which is just one of the useful tips to be found inside Secrets of a Southern Table. This Asian and Cajun-influenced shrimp sandwich is simple to make and bursting with flavor. Try it in a lettuce cup for a lighter lunch. If you can't find lemongrass you can use zest of lemon instead. Heat a grill pan or skillet over medium-high heat. Working with a few pieces at a time, cook the bread until browned and toasted 2 to 3 minutes. (Alternatively, heat the oven to broil and broil the bread until toasted, about 2 minutes, depending on the strength of your broiler.) Set aside and keep warm. Place the shrimp in a bowl. Add the Creole seasoning and toss to coat. Melt the butter in a large skillet over medium-low heat. Add the garlic, jalapeno, ginger, and lemongrass. Cook until fragrant, 45 to 60 seconds. Add the shrimp and increase the heat to medium-high. Add the lemon juice, hot sauce, and fish sauce. Cook, turning once or twice, until the shrimp are firm and pink, 1 to 2 minutes per side. Taste and adjust for seasoning with salt and pepper. 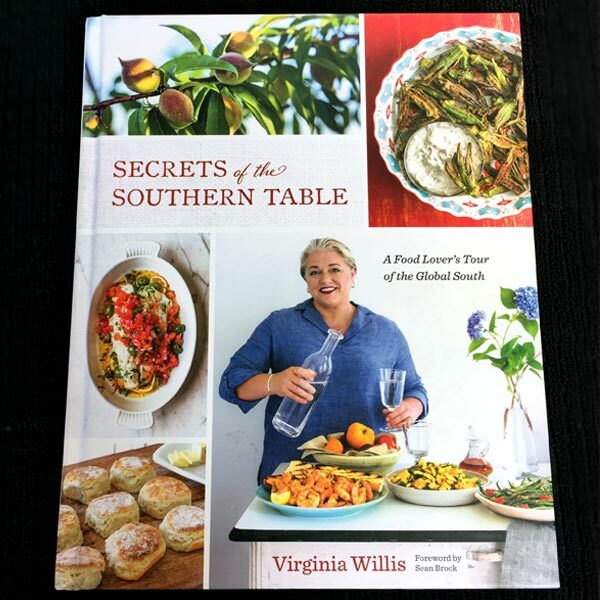 Secrets of the Southern Table will expand your culinary landscape and understanding of what is truly Southern. It proves that Southern cuisine is chicken and collard greens as well as international dishes such as arepas and bulgogi. I love this fusion of cultures that continues to shape the food we eat. and then…she paused for thought. Disclaimer: I received a copy of Secrets of the Southern Table to cook with, as always, all opinions are my own. Southern cooking is new to me so I guess I will be creating new delicious memories of Southern cuisine from now on. Thanks for stopping by! Oh yum! I definitely would LOVE this sandwich! I love spice with shellfish! Thanks Valentina, it is such a wonderful mix of flavors. Ha! I didn’t realize you were sitting right behind us! Love this! The shrimp in this recipe is divine. Thank you for sharing it!! I can’t say enough good things about this shrimp recipe! All of those dishes look fabulous! But that SHRIMP! Wow, I just had dinner, but am craving shrimp all the same! 🙂 Looks like a great cookbook! Thanks Christina, I am very excited about cooking more for this cookbook once it is cool enough to turn on the oven again. 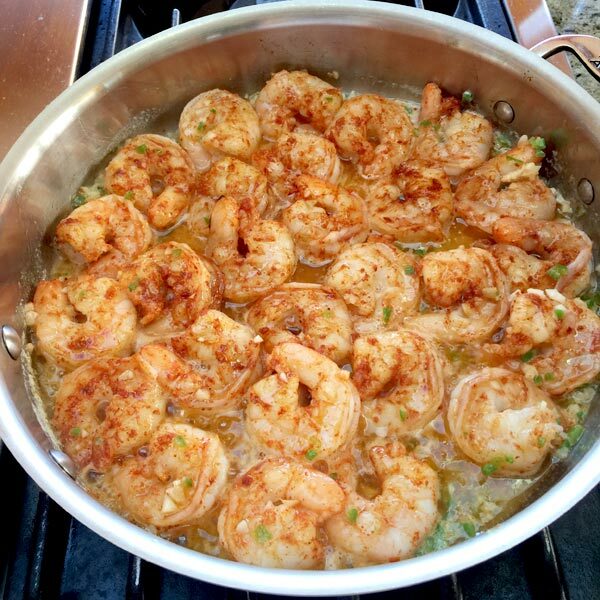 I make New Orleans BBQ shrimp and can’t wait to try this Asian version…I’m pinning. Thanks Karen, I hope you enjoy this recipe as much as I did.